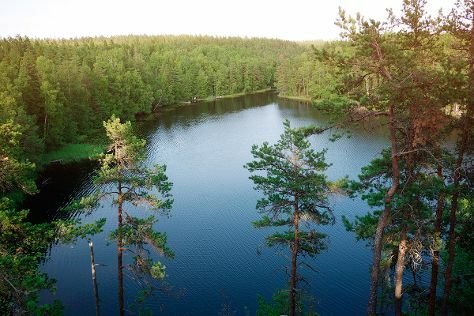 Step out of the city life by going to Nuuksio National Park and Niivermaki Nature Conservation Area. Your inner history buff will appreciate Rock Church and Helsinki Cathedral. Venture out of the city with trips to Teijo national park (in Pernio), Hiidenkirnut (in Askola) and Sipoonkorven Kansallispuisto (in Vantaa). There's lots more to do: explore the galleries of Sea Fortress Suomenlinna, make a trip to Senate Square, get engrossed in the history at Seurasaari Island and Open-Air Museum, and head outdoors with Arctic Expedition. To see reviews, other places to visit, traveler tips, and more tourist information, you can read our Helsinki online day trip planner . If you are flying in from South Korea, the closest major airport is Helsinki Vantaa Airport. In August in Helsinki, expect temperatures between 24°C during the day and 13°C at night. Finish up your sightseeing early on the 9th (Fri) so you can travel back home.